"Stab jacket" redirects here. For a type of body armor, see stab vest. A buoyancy compensator also called a buoyancy control device, BC, BCD, stabilizer, stabilisor, stab jacket, wing or ABLJ depending on design, is a piece of diving equipment containing an inflatable bladder which is worn by divers to establish neutral buoyancy underwater and positive buoyancy on the surface, when needed. The buoyancy is controlled by adjusting the volume of air in the bladder. The bladder is filled with gas from the diver's air tank via a low-pressure hose from the regulator first stage, directly from a small cylinder dedicated to this purpose, or from the diver's mouth through the oral inflation valve. A bladder to contain gas which may be added or released during the dive to control buoyancy. A means of adding gas to the bladder, generally a low pressure direct feed or power inflator that injects gas from a low pressure hose from the diving cylinder's diving regulator or an auxiliary cylinder to the bladder(s) of the BC, that is controlled by an inflation valve, and usually an oral inflation option. These are usually at the end of a corrugated rubber inflation hose. A vent valve or dump valve that allows gas to be released or to escape in a controlled fashion from the bladder(s) of the BC. Most BCs have at least two vents: one at the extreme top and the other at the bottom of the BC, for use as air migrates to whichever part of the BC is uppermost, the vent situated at the shoulder is used when the diver is upright and the vent situated nearer the diver's waist is used when inverted. Venting through the oral inflation system is also usually possible. An over pressure relief valve that automatically vents the bladder if the diver over inflates the BC by ascending or by injecting too much gas. This is usually a secondary function of the vent or dump valve, and is a necessary safety feature to prevent over-pressure damage. A means of securing the BC to the diver to transfer buoyancy forces, and to hold the BC in the position intended for its designed function. The BC is typically secured to a diver's torso, either with dedicated straps or as part of a multifunctional system integrated with the bladder or casing. A tough textile casing to contain and protect the bladder, and to which most of the other components are attached, with zippers for access to the bladders. A crotch strap may be included in the harness to prevent the BC from sliding towards the head when the diver is upright and the bladder is inflated. A cummerbund is an alternative approach to reduce the tendency for the BC to slide towards the head by providing a close fit around the waist. An integrated diving weighting system - pockets for lead weights with a quick release mechanism. Integrated weights can eliminate the need for a separate weight belt. Trim weight pockets for adjusting the position of the diver's centre of gravity to improve diver trim. Emergency inflation cylinders. This can either be a small (about 0.5 litre) air cylinder, filled from the diver main cylinder, or a small carbon dioxide cylinder. Reflective tape for better visibility. A redundant bladder with associated filling and venting components, as a backup in case of failure of the primary bladder. Alternative breathing gas regulator connected to or integrated with the inflation/deflation valve assembly. An adjustable buoyancy life jacket (ABLJ) is fitted around the neck and over the chest, secured by straps around the waist and usually between the legs. They are sometimes referred to as "horse collars" because of their resemblance, and are historically derived from the inflatable UDT vest or Mae West life jacket issued to World War II flyers and divers. They were developed in the 1960s and have been largely superseded by wing and vest type BCs, primarily because of their tendency to shift the diver's center of buoyancy towards the head with inflation, which adversely affects the diver's trim underwater. The ABLJ's location on the diver's chest and round the neck provides the best buoyancy distribution of the buoyancy compensater designs when it comes to floating a distressed, fatigued or unconscious diver face-up on the surface in the event of a problem. The Dacor Seachute BC4 had unique upper and lower bladders. The upper bladder was around the neck and could be inflated by the CO2 cartridge for use as a surface life jacket. The lower bladder was over the diver's stomach area, and was inflated by LP gas from the regulator, for buoyancy control underwater. This arrangement provided better buoyancy distribution for trim control while diving than most other front inflation systems. Wraparound bladders are favored by some divers because they make it easier to maintain upright attitude on the surface. However, some designs have a tendency to squeeze the diver's torso when inflated, and they are often bulky at the sides or front when fully inflated. Back inflation BC's are less bulky at the sides but may have a tendency to float the diver tilted forward on the surface depending on weight and buoyancy distribution, which presents a possible hazard in an emergency if the diver is unconscious or otherwise unable to keep his or her head above the water. Vest BC's, whether back-inflated or wraparound, typically provide up to 25 kilograms of buoyancy (depending on size) and are fairly comfortable to wear, if of the correct size and adjusted to fit the diver. Vest BC's are the most common type among recreational divers because they can integrate buoyancy control, weights, attachment points for auxiliary gear, and cylinder retention in a single piece of gear. The diver need only attach a cylinder and regulator set in order to have a complete scuba set. Some "tech-rec" (technical and recreational) vest BC's have the ability to carry multiple cylinders - Twin sets on the back, and sling cylinders at the sides, suspended from D-rings. The lack of flexibility of positioning the D-rings due to structural constraints on some designs is partly compensated by fitting larger numbers of D-rings, some of which may be in the right place for a given diver. The original stabilizer jacket patent by Scubapro featured a buoyancy bladder which allowed air flow around the arms and around the backpack - the trademarked 360° flow-through design. This was a complex bladder to manufacture. Over-the-shoulder bladder, separated under the arms, which has a centre of buoyancy fairly high on the body when fully inflated, which tends to hold the diver upright at the surface. These are bulky over the front of the torso, particularly in the shoulder and chest area, and relatively clear to the sides under the arms. With extensions of the bladder from the lower back forward under the arms, but separated at the shoulders, and no buoyancy on the upper chest, which has a lower centre of buoyancy when fully inflated, and tends to tilt the diver backwards when fully inflated at the surface. These can be very bulky under the arms when integrated weighting and/or pockets are added, and for smaller waisted divers, also to the front of the waist area, but are relatively clear in the chest and shoulder area. The "shell" or bladder casing is usually separate from the cummerbund, which can be snugly fitted while leaving the bladder a relatively loose fit around the torso, to avoid restricting breathing when fully inflated. BC attachment systems are generally intended to limit the shifting of the BC as a result of the lifting forces, including minimizing the tendency to slide towards the head when the diver is upright while the bladder is inflated. If the diver is wearing a weight belt, this will pull in the opposite direction to BC lift when the diver is upright, and can result in the diver sagging down in the jacket when floating at the surface. Solutions to this problem include the cummerbund (a broad adjustable waist band) and the crotch strap (a strap between the legs). The crotch strap, when adjusted correctly, is effective at preventing this shift, but may prevent the weight belt from falling clear of the diver if dropped in an emergency. Fitting the weight belt over the crotch strap after putting the BC on can be difficult. The cummerbund is an attempt to avoid this problem, as the weight belt can not be snagged on it in the same way, but the weight belt must then be worn either under the cummerbund, obstructing access to the buckle, or below the cummerbund. The effectiveness of a cummerbund depends on a waistline which is smaller than the circumference of the upper torso, and it may constrain free breathing if fitted too tightly. This tendency of the inflated BC to shift towards the head is less of a problem when the weights are carried in integrated weight pockets on the BC, but it may then have a tendency to slide towards the head when deflated on an inverted diver underwater. This is less of a problem for the average recreational diver, who does not spend much time head down underwater. 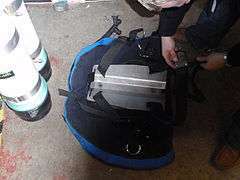 Back inflation buoyancy compensators are typified by the stainless steel backplate and wing arrangement popular with technical divers, but other arrangements are also available. Wings or Backplate and wing consist of an inflatable bladder worn between the diver's back and the cylinder(s). Invented by Greg Flanagan in 1979 for North Florida cave divers, the back plate and wing configuration is not a recent development, but has regained popularity because of suitability for technical diving where it is often used, as the technical diver often carries multiple cylinders on his back and/or clipped to D-rings on the harness webbing. The bladder and cylinders or rebreather are fastened to a backplate which is strapped to the diver by the harness. The wing design frees the divers sides and front and allows for a large volume bladder with high lift capacity (60 lbs /30 liter wings are not uncommon). Some designs use elasticated webbing or bungee cords around the bladder to constrict the bladder when not inflated, although there is dispute as to the wisdom of this addition. 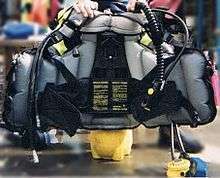 Other back inflation buoyancy compensators are more like the jacket style regarding the structure, attachment to the diver, and accessories, differing mainly in the bladder position, which is similar to a wing, being entirely behind the diver, without extensions to the sides or front. A few short-lived rigid air compartment back inflation BCs were marketed in the 1970s. A hybrid arrangement is also possible, which has most of the buoyancy in the back, but has a small amount to the sides below the arms. Technical divers preparing for a mixed-gas decompression dive using a backplate and wing setup with sling mounted decompression gas cylinders. A variation on the back mounted buoyancy compensator is used without a backplate for side mount diving This arrangement is functionally similar to wearing the buoyancy compensator sandwiched between the cylinder(s) and backplate, but there is no backplate or back mounted cylinder. The buoyancy cell may be mounted between the sidemount harness and the diver, or on top of the harness. Some side mount harnesses are adaptable for use with a back mount cylinder as an option, without the rigid backplate. Buoyancy compensators of all types have been made in both single skin and casing and bladder arrangements. The strength and damage resistance of both these systems of construction depend more on the design details and quality of materials and manufacture than on the choice of arrangement, though maintenance may vary, as it is quicker to clean, dry and inspect a single skin than a bladder and casing, and the bladder and casing will have more components for an equivalent layout. A single skin construction uses the material of the buoyancy bladder as the structural material for the unit, and a casing and bladder structure uses the casing for load bearing purposes and to protect the bladder, which is a replaceable part. negative buoyancy: when the diver wants to descend or stay on the seabed. neutral buoyancy: when the diver wants to remain at constant depth, with minimal effort. positive buoyancy: when the diver wants to rise or float on the surface. To achieve negative buoyancy, divers who carry or wear buoyant equipment must be weighted to counteract the buoyancy of both the diver and the equipment. If the diver's exposure suit is made of a compressible gas-filled material such as foamed Neoprene, the volume of the material will change (Boyle's Law) as the pressure changes when the diver descends and ascends. The volume of air in the BC is adjusted to compensate for this. Gas contained in the flexible air spaces within the diver's body and equipment (including gas in the BC) is compressed on descent and expands on ascent. The diver normally counteracts this by adding gas to the space or drysuit, in order to avoid "squeeze". Gas content in the BC is adjusted to correct buoyancy if these other corrections are not enough. As the dive proceeds, gas is consumed from the diving cylinders of the breathing equipment. This represents a progressive loss of mass which makes the diver more buoyant; the diver’s overall buoyancy must be reduced by venting air from the BC. For this reason the diver needs to configure his equipment to be a little overweight at the beginning of the dive so that neutral buoyancy can be achieved after the loss of the weight of the breathing gas. Air or nitrox weighs about 1.3 grams for every litre at standard pressure. Thus, the magnitude of weight change from loss of air during a dive varies from roughly 4.3 kg (9.5 lbs) representing the total air content of a steel 15 litre cylinder at 230 bar/3500 psi (in practice, reserve requirements dictate that only about 8 lbs of this will be breathed), to about 5 lbs difference for the smaller 80 ft3 aluminum-80 (AL80) tank (11.1 litres internal capacity) pressurised to 200 bar/3000 psi, and again assuming that only 5/6ths of the air in the tank is used, leaving a typical safety reserve. In practice, the diver doesn't think about all this theory during the dive. To remain neutrally buoyant, gas is added to the BC when the diver is negative (too heavy), or vented from the BC when the diver is too buoyant (too light). A feature of diving is that there isn't any automatically stable equilibrium position for a diver wearing a BC, or even simply for a diver with lungs full of air. Any change in depth from a position of neutrality and even a small changes in volume, including the simple act of breathing, result in a force toward an even less neutral depth. Thus, maintenance of neutral buoyancy in scuba must be a continuous and active procedure—the diving equivalent of balance, in a positive feedback environment. Fortunately, the diver's mass provides a source of inertia, as does the liquid medium, so small perturbations (such as from breathing) can be compensated for easily by an experienced diver. A feature of scuba which is often non-intuitive for beginners, is that gas generally needs to be added to the BC when a diver descends in a controlled manner, and vented (removed or dumped) from the BC when the diver ascends in a controlled manner. This gas (added or vented) maintains the volume of the gas in the BC during depth changes; this bubble needs to remain at approximately constant volume for the diver to remain even approximately neutrally buoyant. When gas is not added to the BC during a descent, the gas in the BC decreases in volume due to the increasing pressure, resulting in a decrease in buoyancy and faster descent with greater depth, until the diver hits the bottom. The same runaway phenomenon, an example of positive feedback, can happen during ascent, resulting in uncontrolled ascent, until a diver prematurely surfaces without a safety (decompression) stop. This effect is greatest near the surface where volume change is greatest in proportion to depth change. With experience, divers learn to minimize this problem, starting by minimizing the volume of gas required in their BC's. This requires using the minimum weighting needed for their equipment. This keeps the volume of the gas in the BC as small as possible at the beginning of a dive, leaving just enough gas in the BC to be able to compensate for the expected slow loss of weight as the dive progresses, as a result of gas use, which will vary according to the dive, but is limited by the cylinder contents. (in practice, for a recreational diver, this will be about 5 to 8 pounds (2.3 to 3.6 kg) per cylinder). Somewhat complex trained reflex behaviors may be developed by experienced divers, involving breathing control and BC gas management during depth changes, which allow them to remain neutrally buoyant from minute to minute during a dive, without having to think much about it. Skilled scuba divers may often be identified by the their ability to maintain constant depth without fin use, as fish do. The vertical-horizontal orientation, or trim, of the submerged diver is influenced by the BC and by other buoyancy and weight components and contributed to by the diver's body, clothing and equipment. The diver typically wishes to be positioned nearly horizontally (prone) while under water, to be able to see and swim usefully, but more nearly vertical and perhaps partly supine, to be able to breathe without a regulator when on the surface. Buoyancy and trim can significantly affect hydrodynamic drag on a diver and the effort required to swim. The effect of swimming with a head up angle, of about 15° as is quite common in poorly trimmed divers, can be an increase in drag in the order of 50%. The orientation of a static and stable object in water, such as a diver, is determined by its center of buoyancy and its center of mass. At equilibrium, they will be lined up under gravity with the center of buoyancy vertically on a line with, (and preferably above) the center of mass. The diver's overall buoyancy and center of buoyancy can routinely be adjusted by altering the volume of the gas in the BC, lungs and diving suit. The diver's mass on a typical dive does not generally change by what seems like much (see above—a typical dive-resort "aluminum 80" tank at 200 bar contains about 2.8 kg (~6 lbs) of air or nitrox, of which about 2.3 kg (~5 lbs) is typically used in a dive, although any air spaces such as in the BC and in diving suits will expand and shrink with depth pressure. Large changes in buoyancy are of course possible if the weight belt is jettisoned, or a heavy object is picked up. Generally, the diver has little control of the position of the center of buoyancy in the BC during a dive, only the amount of buoyancy. 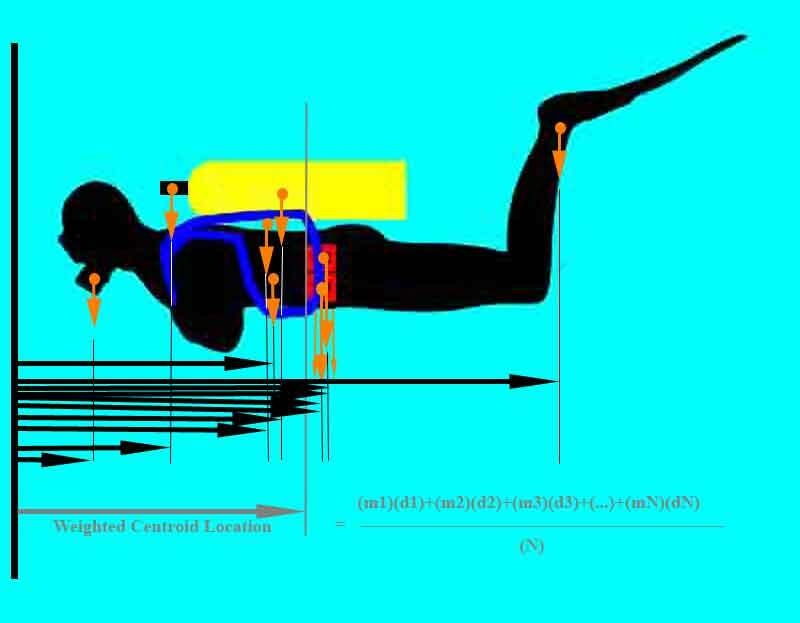 However the diver can change his/her centre of gravity by adjustment of the equipment setup, which includes its configuration and position of weights, which ultimately influence where the effective BC lift is positioned relative to his Center of Gravity. Traditionally, weight belts or weight systems are worn with the weights on, or close to, the waist and are arranged with a quick release mechanism to allow them to be quickly jettisoned to provide extra buoyancy in an emergency. Weight carried on a belt can be distributed to shift the weight forward or backward to change the position of the diver's center of mass. Systems that integrate the weights into the BCD, can provide added comfort so long as the BCD does not have to be removed from the body of the diver, for example in an underwater emergency such as an entanglement. When a weight integrated BCD is removed a diver wearing no weight-belt and any type of foamed neoprene wetsuit will be very buoyant. By inflating the BC at the surface, the conscious diver may be able to easily float face-up, depending on his equipment configuration choices. A fatigued or unconscious diver can be made to float face up on the surface by adjustment of their buoyancy and weights so the buoyancy raises the top and front of the diver's body and the weights act on the lower and back of the body. An inflated Horse-collar always provides this orientation, but an inflated vest or wing may float the diver face-down if the center of buoyancy is behind the centre of gravity. This floating orientation is generally considered undesirable and can be minimized by relocation of some of the weights further to the rear, and using higher density cylinders (typically steel), which also move the center of mass towards the back of the diver. The BC type can also be selected with this factor in mind, selecting a style with a center of buoyancy further forward when filled, as this has the same net effect. Any or all of these options can be utilized to trim the system out to its desired characteristics and many factors can contribute, such as the number and position of diving cylinders, the type of diving suit, the position and size of stage cylinders, the size and shape of the diver's body and the wearing of ankle weights, or additional dive equipment. Each of these influence a diver's preferred orientation under the water (horizontal) and at the surface (vertical) to some degree. There is a risk that an emergency inflation cylinder can be accidentally opened during a dive causing a rapid ascent and barotrauma to the diver. Carbon dioxide, being poisonous at high partial pressures, could be a dangerous gas to have in a BC because the diver may inhale it from the bag underwater., but it is unlikely that this would happen, as the diver would usually be aware that the emergency inflation has been operated. Redundant bladders may be inadvertently filled, either by unintended action of the diver, or by malfunction of the filling mechanism, and if the failure is not recognized and dealt with promptly, this may result in a runaway uncontrolled ascent, with associated risk of decompression sickness. There is a risk that the diver will not recognise which bladder is full and dump from the wrong one. Catastrophic bladder failure due to puncture, tearing or failure of the dump valve or inflation assembly can leave the diver with inadequate buoyancy to make a safe ascent, particularly if diving deep with large gas supply and insufficient ditchable weight. Inflator valve malfunction can inflate the bladder when the buoyancy is not needed, and if not recognized and dealt with promptly, can result in uncontrolled ascent with associated risk of decompression illness. This can happen more quickly with inflators combined with alternative demand valves as they must use a larger bore hose connector. However, the standard overpressure and dump valves provided are able to vent air faster than the inflator valve can fill the bladder. Ineffective or poorly adjusted cambands may let the cylinder slip and it may fall off the harness. 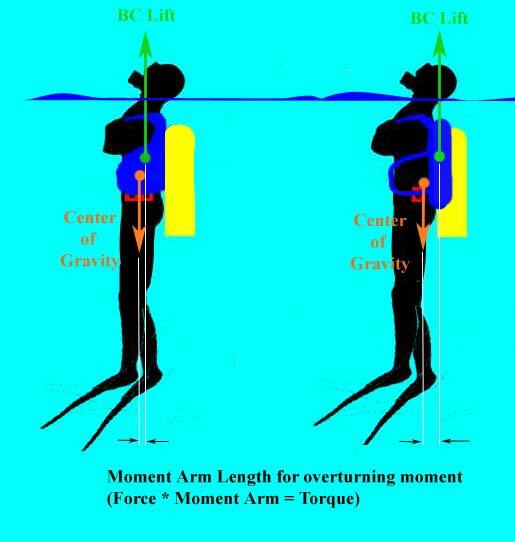 Some designs of BC combined with poor weight and buoyancy distribution may support an unconscious diver face down at the surface. In some cases an excessively large jacket BC can cause an unconscious diver to be supported face down at the surface. A loose-fitting BC without a crotch strap may slide up the diver and fail to keep his head out of the water at the surface. The usual inflation system is from a low-pressure hose from the primary breathing gas supply, but a dedicated direct feed pony bottle was common on early buoyancy compensators, and remains an option for some models. Most BCs allow oral inflation both underwater and on the surface. This could theoretically reduce gas consumption, but is generally not considered worth the effort and slightly increased hazard of taking the DV out of the mouth underwater, and possibly having to purge it before breathing again. Oral inflation is, however, an alternative inflation method in case of a failure of the pressurized inflation system. Emergency inflation by expendable CO2 cartridge is provided on some BCs. Gas consumption varies depending on the dive profile and diver skill. The minimum consumption is by a diver who uses the correct amount to neutralize buoyancy and does not waste gas by overfilling, or by excessive weighting. The actual volume of the bladder should not affect gas consumption by a skilled user. Deep dives will require more gas, and dives in which the diver ascends and descends by large amounts and/or frequently, will require venting for each ascent and top up for each descent. The amount of gas used was generally below 6% of the gas consumption during the dive during US Navy trials and the use of small pony cylinders for inflation was considered adequate, but not necessary. In 1957, F. G. Jensen and Willard F. Searle, Jr began testing methods for manual and automatic buoyancy compensation for the United States Navy Experimental Diving Unit (NEDU). In their early tests, they determined that manual systems were more desirable due to the size of the automatic systems. Later that year, the Walter Kiddie and Co. sent a prototype buoyancy compensating tank for use with two cylinders to NEDU for evaluation. The valves of this aluminium tank system leaked and testing was delayed until 1959 when it was recommended for field testing. The ABLJ was developed by Maurice Fenzy in 1961. Early versions were inflated by mouth underwater. Later versions had their own air inflation cylinder. Some had carbon dioxide inflation cartridges (a holdover, for surface use, of the Mae West flyer's lifejacket) to facilitate emergency ascent. This was abandoned when valves that allowed divers to breathe from the BC's inflation bag were introduced. 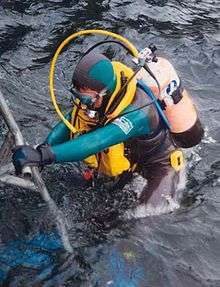 The Fenzy ABLJ provided a proof of concept for buoyancy compensation, however the large-volume ring behind the diver's neck caused the jacket to ride up against the diver's throat, despite the crotch strap. In 1968, dive shop owners, Joe Schuch and Jack Schammel, developed a more comfortable buoyancy compensator vest that featured a smaller buoyancy ring behind the diver's head, and a midriff section with sufficient volume to lift the diver's head out of the water in the event that one or both of its CO2 cartridges were activated for emergency ascent. In 1969, the original Control Buoyancy Jacket or "CBJ" was manufactured by Waverly Air Products of Chemung, NY and sold in dive shops throughout the east coast of the United States. By 1970, a push-button inflator using air from the diver's SCUBA tank augmented the manual inflation hose. Since 1970 most BCs have used for inflation mainly gas from one of the diver's main cylinders, and an oral inflation tube have been generally retained for abnormal situations (no high pressure gas left, malfunction of an inflator hose) both underwater and on the surface. In 1972, Watergill developed the At Pac wing, the first wing-style BC, which was provided with a cummerbund and padded shoulder straps, and an integrated weight system. Rigid shell back inflation buoyancy compensators were marketed by U.S Divers (UDS-I system) and Dacor (CV Nautilus)for a short period in the mid 70s. The Nautilus had an automatic inflation system using a regulator to maintain a constant volume, but the changes in buoyancy due to wetsuit compression and gas usage were not well compensated and the system never caught on. More recent innovations for jacket BCs include weight pouches to adjust attitude underwater, putting the weights on the BC rather than on a weightbelt, integrated regulators, heavily reinforced 1050 denier ballistic nylon. Innovations for backplate and wing include redundant bladders, stainless steel backplates, lightweight soft nylon backplates, and 85 lb lift bladders. Dive Rite pioneered the first purpose-built wing for diving twin cylinders in 1985. Other tech diving wing manufacturers include Ocean Management Systems, Halcyon and Oxycheq. Other BC manufacturers include Sherwood, Zeagle, Scubapro, Mares and Cressisub. Wikimedia Commons has media related to Buoyancy compensators. 1 2 3 4 5 Middleton, J. R. (1980). "Evaluation of Commercially Available Buoyancy Compensators.". www.dtic.mil/. US Department of Defense Technical Information Center. Retrieved 5 June 2013. 1 2 3 4 5 6 McLean, David. (2006) History of buoyancy compensators https://drive.google.com/?tab=wo&authuser=0#folders/0B3Z4b8qrjCTWSkJWd1N6YW5udTQ accessed 2 December 2013 "Archived copy" (PDF). Archived from the original (PDF) on 2012-06-26. Retrieved 2011-12-22. 1 2 Kakuk, Brian; Heinerth, Jill (2010). Side Mount Profiles. High Springs, FL: Heinerth Productions. ISBN 978-0-9798789-5-4. 1 2 3 4 Lippmann, John. "The Ups and Downs of Buoyancy Control". Divers Alert Network medical articles. Divers Alert Network S.E. Asia-Pacific. Retrieved 23 May 2016. 1 2 Williams, Guy; Acott, Chris J. (2003). "Exposure suits: a review of thermal protection for the recreational diver". South Pacific Underwater Medicine Society journal. 33 (1). ISSN 0813-1988. OCLC 16986801. Retrieved 2009-06-13. ↑ Fead, L (1979). "Is dropping your weight belt the right response?". South Pacific Underwater Medicine Society Journal (reprinted from: NAUI News, September 1978). 9 (1). ISSN 0813-1988. OCLC 16986801. Retrieved 2009-06-13. ↑ Passmore, M. A.; Rickers, G. (2002). "Drag levels and energy requirements on a SCUBA diver". Sports Engineering. Oxford, UK: Blackwell Science Ltd (5): 173–182. 1 2 Jensen, FG; Searle, Willard F (1957). "Buoyancy Control of Open Circuit Scuba". United States Navy Experimental Diving Unit Technical Report. NEDU-RR-8-57. Retrieved 2009-06-13. 1 2 Janney, G. M; Hanger, G. W (1960). "Walter Kiddie and Co. - Buoyancy Compensating Tank". United States Navy Experimental Diving Unit Technical Report. NEDU-Evaluation-7-60. Retrieved 2009-06-13. Acott, Chris J. (1996). 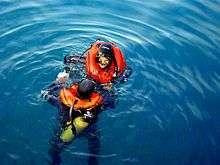 "An evaluation of buoyancy jacket safety in 1,000 diving incidents.". South Pacific Underwater Medicine Society journal. 26 (2). ISSN 0813-1988. OCLC 16986801. Retrieved 2009-06-13.